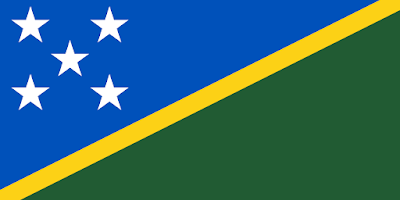 This Week In Vexillology, we're sticking around the South Pacific and taking a look at the flag of the Solomon Islands. Adopted on November 18th, 1977, the five main island groups are represented by the stars. The blue stands for the surrounding ocean, and the green in the flag represents the land. You might think (like I did, initially) that the yellow stripe stands for sand along the beaches- but it doesn't- it represents sunshine. There was a bout of ethnic tension between 1998-2003 that got pretty nasty. (A kaleidoscope of Pacific Nations, including Australia and New Zealand) ended up sending about 2,000 troops and police to help calm things down- but other than that- which, I imagine from their point of view would be a pretty big 'that'- post-independence has been fairly uneventful for the Solomons. Their flag is pretty boss too.